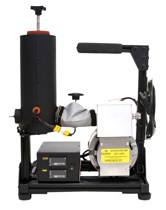 Clean Air Engineering's Heated In-Line Filter Pump Assembly is for use in emissions testing and chemical analysis. Maintaining a steady temperature around 250°F is important to ensure that moisture, acid gas, and other constituents of the gas stream do not condense before entering the analyzing equipment. This can result in the damage of equipment as well as the loss of important data. The Heated In-line Filter and Pump Assembly helps to ensure the accuracy of gas samples by providing a heated route for the gas before analysis. 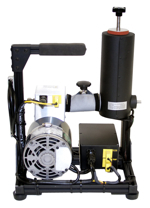 For use in: process monitoring, stack testing, gas and diesel sampling.